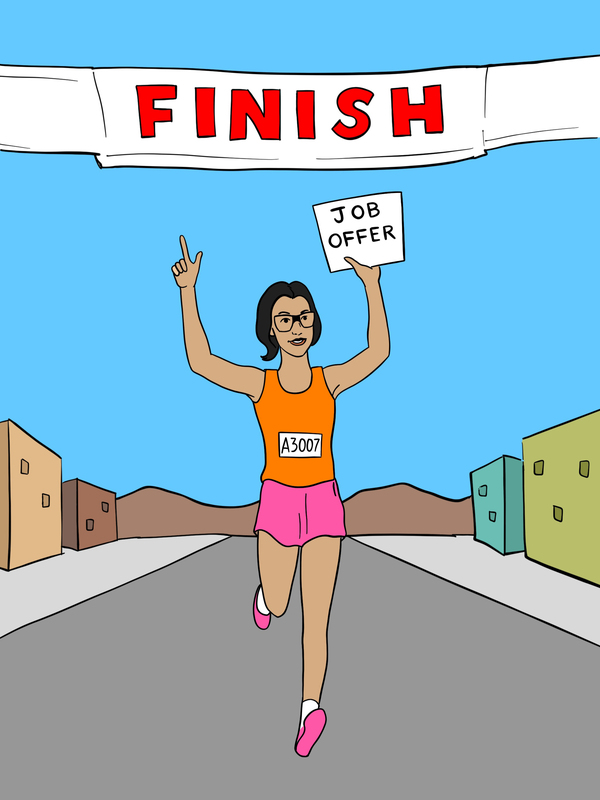 Applying to a software engineering program can seem daunting when you look at the big picture. There’s this new subject you’re trying to learn that may seem abstract- pair that with all of the jargon and the logic-heavy problem solving and one might feel overwhelmed with fear. Well, fear not! We wanted to show you what a typical day in a peer learning and project based program looks like. Peer Learning Days (PLDs) are days where a given cohort is split into groups to review recently covered concepts. PLD groups are made large enough so multiple perspectives can be shared, but small enough to make each student feel individually engaged. These groups generate a positive amount of peer pressure to encourage students to share their thought processes. Students oftentimes spread out over living room style seating, or even bean bags to gear up for a day of collaboration. Students begin their PLD with a clear whiteboard! We simulate what it’s like working in a true engineering environment. The exposure to the working environment structure is invaluable to folks who will be entering the world of Silicon Valley for the first time. “Stand Ups” are used as an efficient way to ensure everyone on a team is on the same page. At Holberton School these daily Stand Up meetings are a chance for the staff and students to make announcements about upcoming events, projects, etc. Holberton School also uses these daily meetings as a time for students to practice their public speaking skills! Each day a student is gives a succinct presentation on a subject of their choosing. 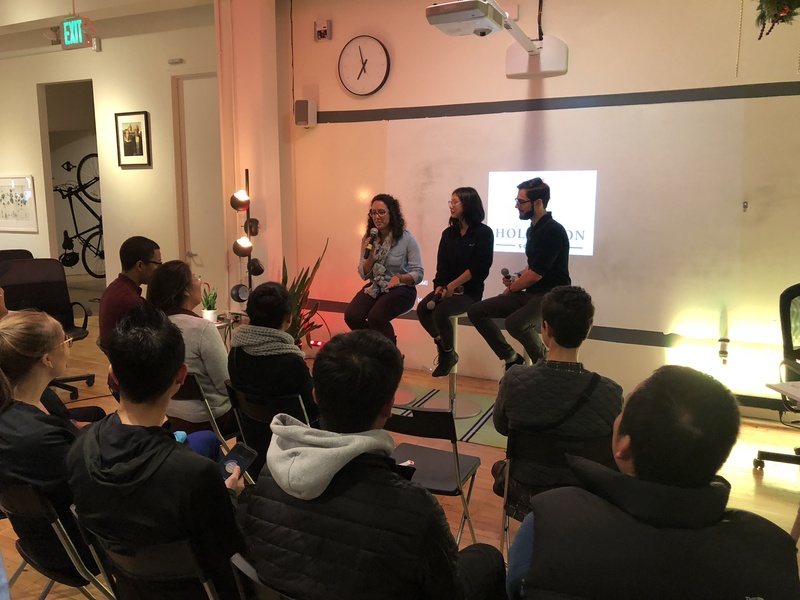 Public speaking doesn’t always come easy for people, and at Holberton we think it’s a soft skill that can help to set our students apart from other software engineers. Students use lunchtime as a way to take socialize further with their fellow future software engineers. 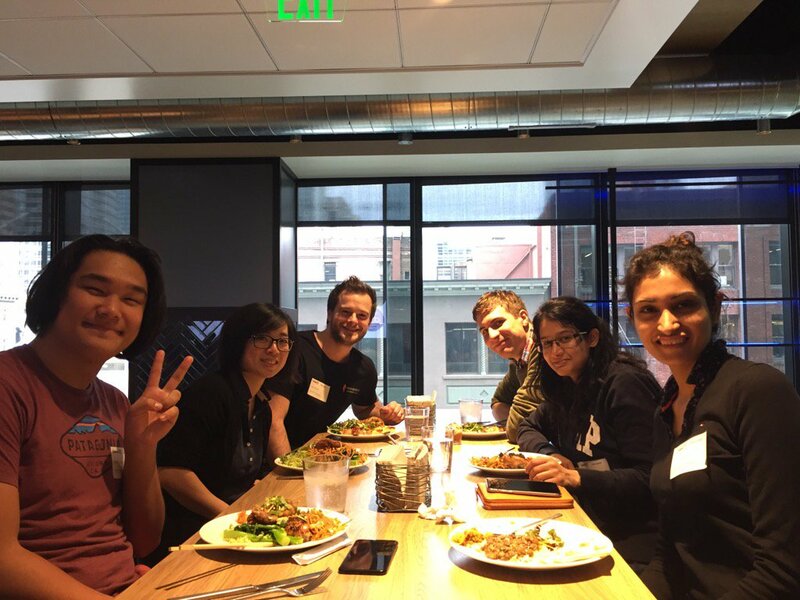 Whether folks choose to bring their own or explore the culinary world of San Francisco, you can bet that from during lunch hour the kitchen is electric with students buzzing about weekend plans, discussing concepts they’re touching upon that day, and of course any number of conversations around blockchain, AI, and other hot tech topics. Students kick back with a laugh over lunch. Re-energized and ready for more review, the groups reconvene to continue their day of peer learning. After much whiteboarding, students extend this peer learning exercise to practical application of these concepts. This mix of understanding programming concepts and practical application is a combination paving the way to success for our students. It isn’t out of the ordinary to see students sticking around after PLD has officially ended. Students are either diving deeper into some of the advanced problems and concepts for extra credit or spending extra time reviewing the mandatory tasks of the day to solidify their understanding of the concepts. We are proud to have cultivated the “above & beyond” work ethic with many of our students resulting in after hours diving deeper with peer learning. The peer learning model serves as practice for students who will be asked to collaborate with peers in a real working environment. Holberton believes soft skills are of equal importance to technical skills. Furthermore, students that fully gain an understanding of a topic are able to practice their coaching skills; tapping into Einstein’s theory that “If you can’t explain it simply, you don’t understand it well enough.” Conversely, PLDs are also one of the best times for students struggling with a specific concept to catch up. The mantra of “teamwork makes the dream work” becomes personified through our peer learning days! One of the most consistent themes at Holberton School is the diverse variety of backgrounds represented in our student body. We’ve had the pleasure of cultivating a true melting pot. Holberton student, Swati Gupta, makes an invaluable contribution to the melting pot culture, bringing her experience from a former career in India. Swati dove into the curriculum head first, quickly distinguishing herself as one of our hardest working students. Swati originally pursued a career in psychology in New Delhi, India. After earning her master’s degree she began working as a counselor. Upon moving to San Francisco, a hub of tech innovation, Swati became interested in a career pivot. Having no prior programming experience, she enrolled in a community college’s computer science program to learn more. “I could’ve received my associate’s degree in computer science but there were general classes in English and social science that I was not interested in, so I didn’t get the degree” Swati explains. Realizing the community college structure was not for her, she reevaluated her options. “Holberton offered a more comprehensive software engineering training” was Swati’s reasoning for choosing Holberton School. We pride ourselves on focusing on the bigger picture. 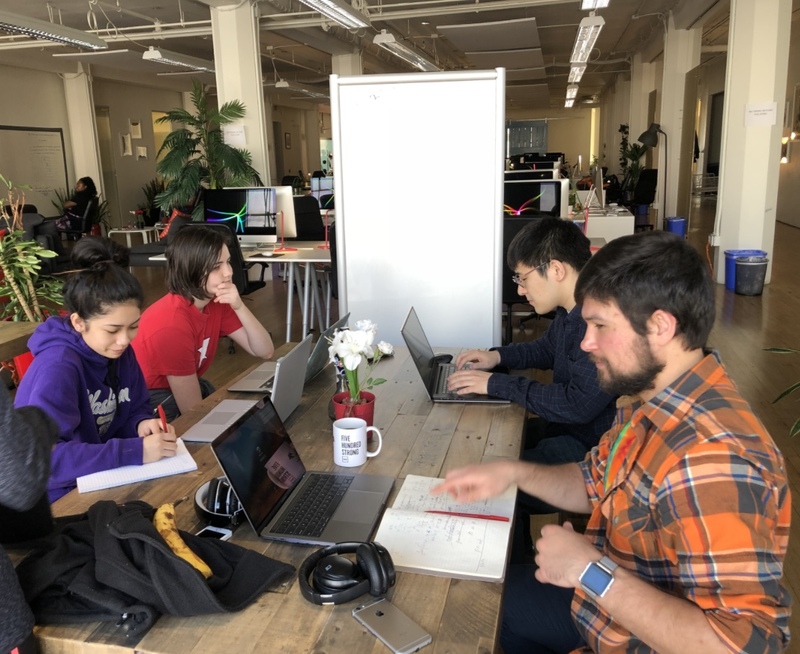 For example, many other programs focus on one specific language or technology, but at Holberton, students work across many different languages and levels preparing them to emerge from the program as a full stack software engineer. “Before Holberton I didn’t know how to use the command line, I didn’t know basic admin commands, how to debug my system when something goes wrong, or how to make my system more secure.” Learning these skills would soon help Swati in her search for an internship. It wasn’t long before she was deciding between a SRE (site-reliability engineer) role with Apple and an engineering internship with NVIDIA. 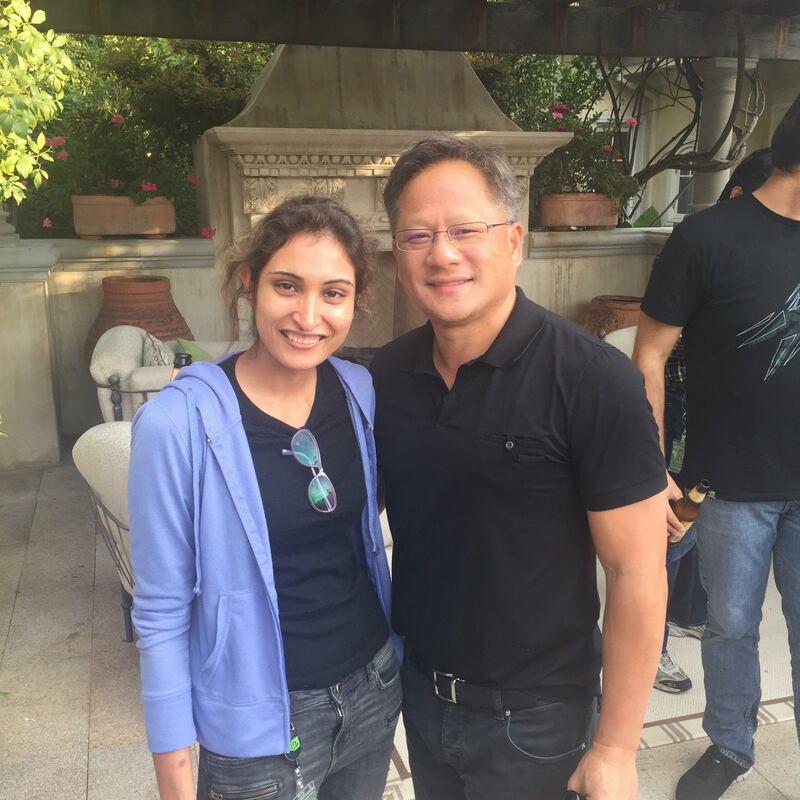 In the end, it was the exciting work that NVIDIA is doing around deep learning and AI that sealed the deal for her. Swati excelled in her internship role and has recently moved into a permanent full-time position as a Software Engineer. Although Swati made the journey look easy, she does have advice for folks interested in learning more “People should really be introspective. It shouldn’t be a one-off thing where they want to get a job and earn money. It’s not that easy. You really have to put yourself into it and keep learning.” Interested in a switch up like Swati? Check out more details about Holberton School here. 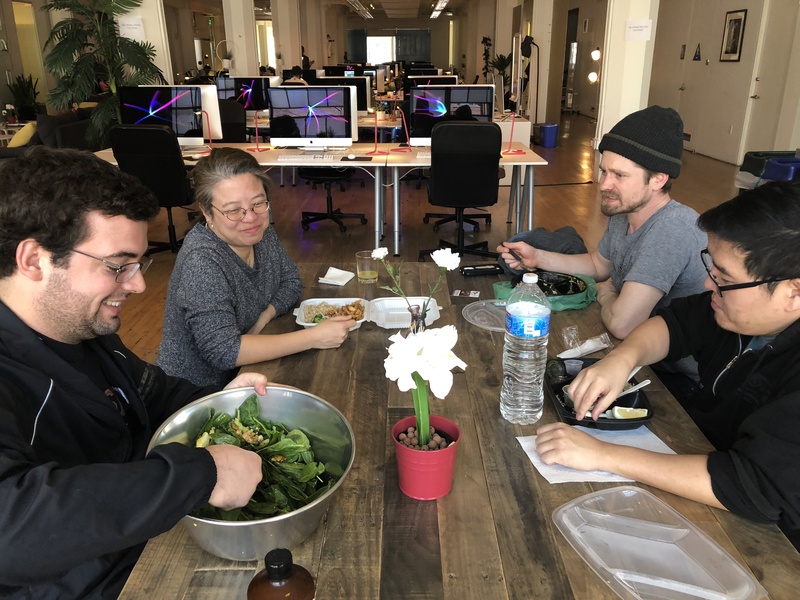 Holberton School’s curriculum places emphasis on mentor relationships. We have mentors spanning various verticals across the tech industry–from Senior Software Engineer, Ludovic Galibert at Netflix to Neha Jain a Software Engineer at LinkedIn. These mentorships are a win-win for industry veterans in many ways. 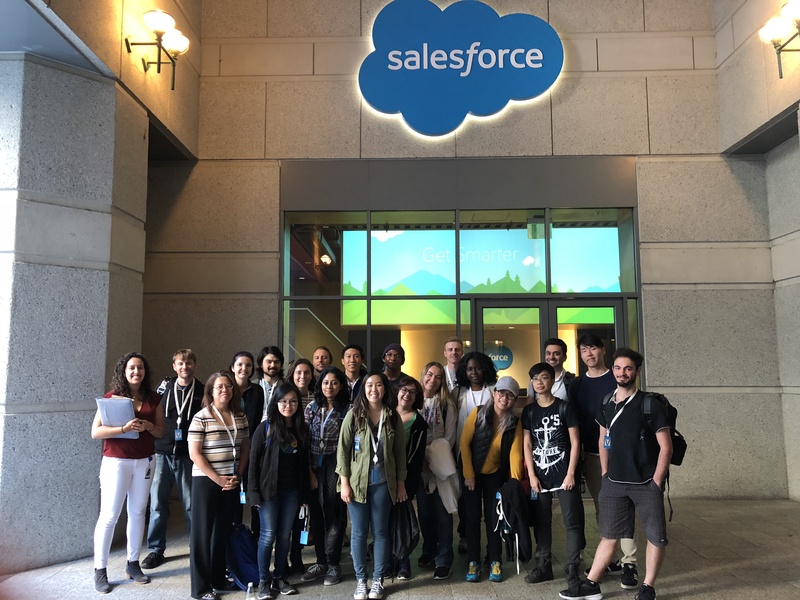 For Ayesha Mazumdar, a Senior UX Engineer at Salesforce, mentoring has been a constant ever since her high school years. Opportunities to mentor has meant personal growth and, in turn, advancement in her career. Ayesha started a Computer Science Club when she was in high school whose mission was to visit local middle schools and begin teaching students the coding basics. Her passion for mentoring continued throughout her college career, working towards a similar goal. 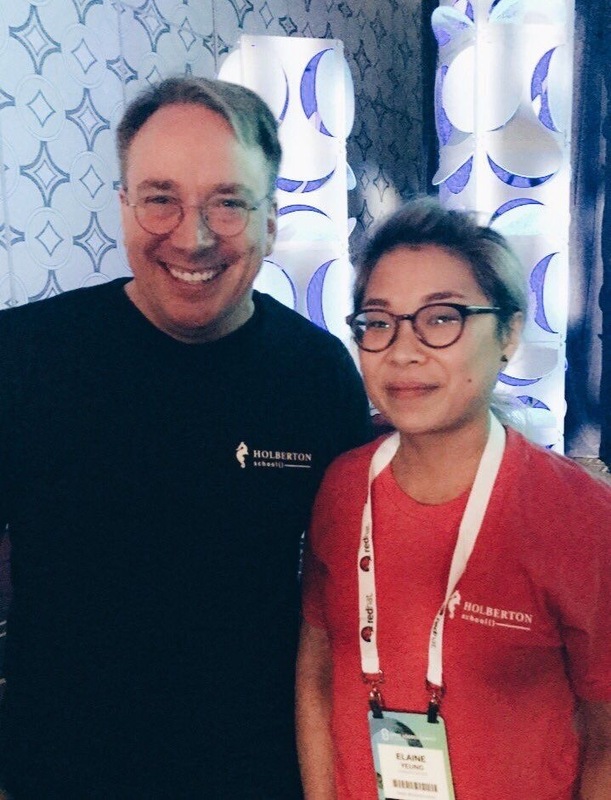 After graduating, Ayesha was eager to get connected with her next mentoring relationship when Holberton School sparked her interest stating “the whole Holberton School system really resonated with me…” She explained to me she was drawn to the practical nature of the curriculum and wanted to help impact the next generation of software engineers. We chatted about what skills Ayesha relies on to do her job most efficiently, and it’s no coincidence the skills she highlights are paramount in Holberton’s curriculum. “Communication, definitely! You have to be able to communicate well with your technical and non-technical peers. Being comfortable speaking in front of a group of your peers is also super important.” Communication and public speaking practice are two hallmarks of our program. Ayesha has a few words of wisdom for the aspiring mentor “One of the great parts about mentoring is seeing that each person has a very different perspective on how certain things work depending upon how they were brought up in the industry–I think that if someone wants to be a mentor they should remember that they can bring value to at least one person.” Ayesha’s even if it helps just one person it was worth it mindset is an asset to our mentoring program. It’s no surprise she’s experiencing success in the form of upward mobility in the Salesforce organization. We look forward to our continued relationship with Ayesha and commend her for all of her mentoring service. If you’re interested in becoming a mentor check out the info here! 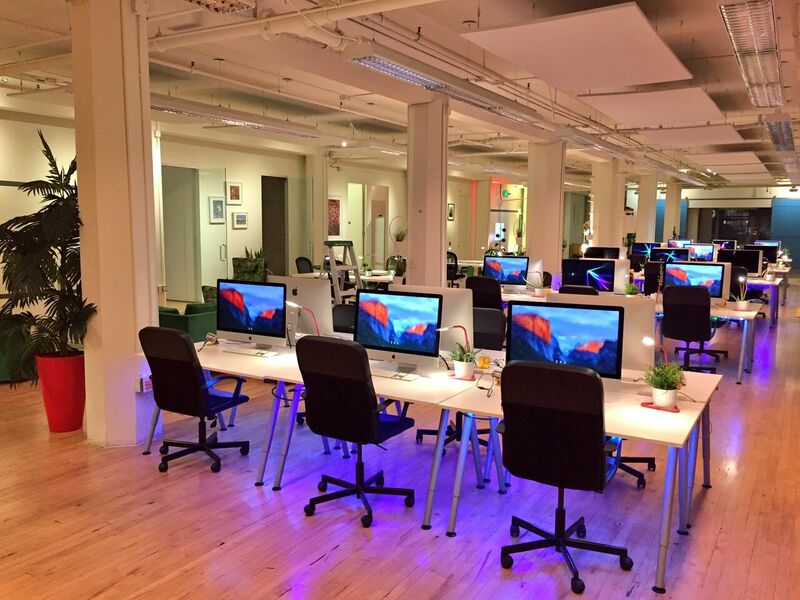 Let Me Upgrade Ya: Holberton School Moves Into New SOMA Location! Everyone in the Holberton School family from staff, to mentors, to Holbie fans are delighted with the move from San Francisco’s FiDi to it’s SOMA- or, South of Market- neighborhood! 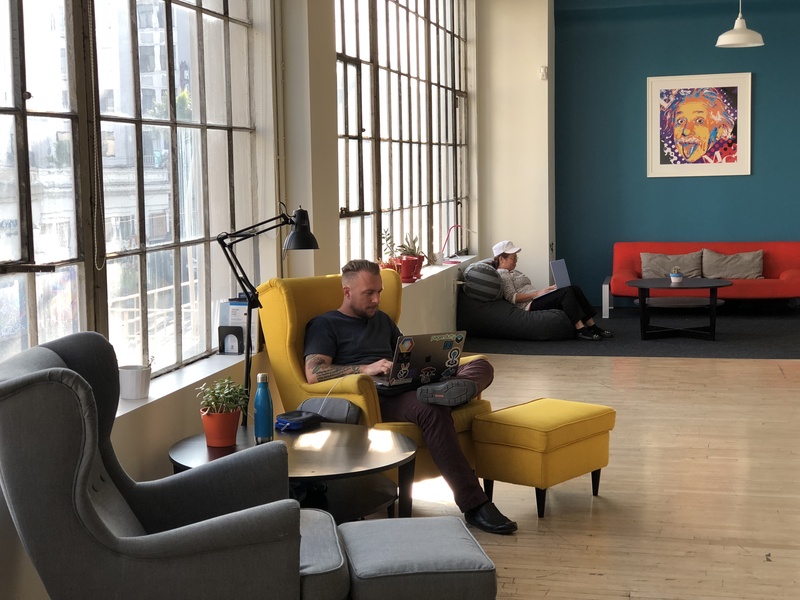 Located at Mission and 5th/6th in the SOMA district of San Francisco, the new location is close to tech companies including Slack, Eventbrite, Yahoo!, Y Combinator and more. This move comes at the perfect time as staff and students get ready to welcome the January 2018 cohort. The building can eventually accommodate up to 1,000 students and we are looking forward to opening the space to many more future software engineers. The upgrade is made notable by more than doubling the amount of space of the school’s original site. 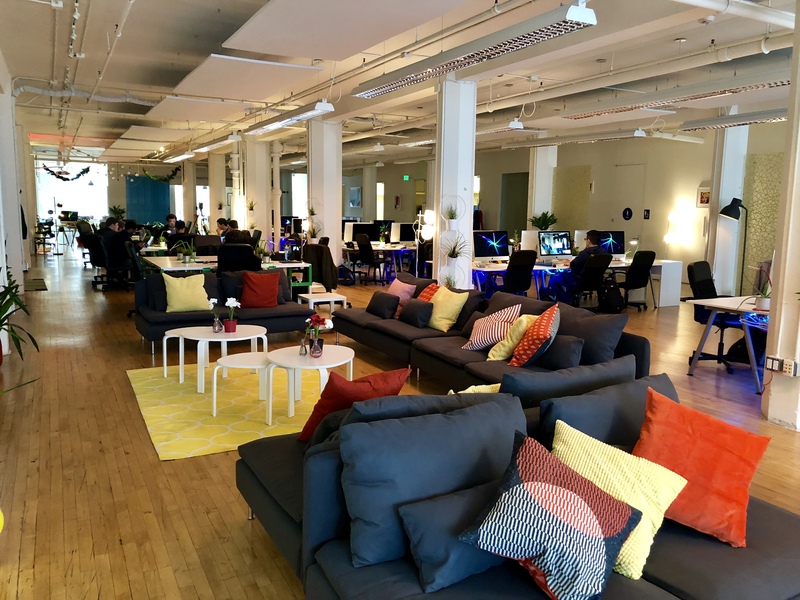 The new spot already feels like home to Holberton, complete with hardwood floors that glow in the natural light provided by the space’s sizable windows. We’ve decorated the space with both comfort and functionality in mind- as whiteboarding is one of the foundations of solving any programming problem, we’ve outfitted the space with enough whiteboard space to satisfy even the most voracious dry-erase-programmer! While the average classroom setting is configured with desks in neat rows, facing the front of the room. Holberton has sought to accommodate all types of learners- are you the type to be most productive curled up in an armchair, sofa, or even a bean bag chair?! No problem, Holberton has a variety of options in that department with various living room-style vignettes. However, if you’re one to appreciate the typical desk/desktop setup we’ve got you covered, too. We’ve equipped our space with brand new iMacs accessible to all students. The community vibe has not been lost in the larger space thanks to the finer details. Students can be found collaborating in the kitchen over a meal or sipping coffees, and even gathered in the meetup area bouncing around ideas with a student-led peer learning session. The ample space for collaboration lends itself to the peer learning model Holberton has founded its success upon. There are plenty of conference rooms for groups to work on projects if the open space doesn’t provide the vibe you’re looking for. If you’re curious about the new digs or just want to check out what Holberton is all about, our doors are always open for a visit and a chat. We’d be delighted to show you around and give you the 4-1-1 on Holberton’s curriculum and the opportunities in software engineering! We’ve even got an Open House scheduled for Thursday 1/18 @ 6:00 PM! This is the perfect excuse to come check out the school and chat with Holberton students, staff, and mentors! 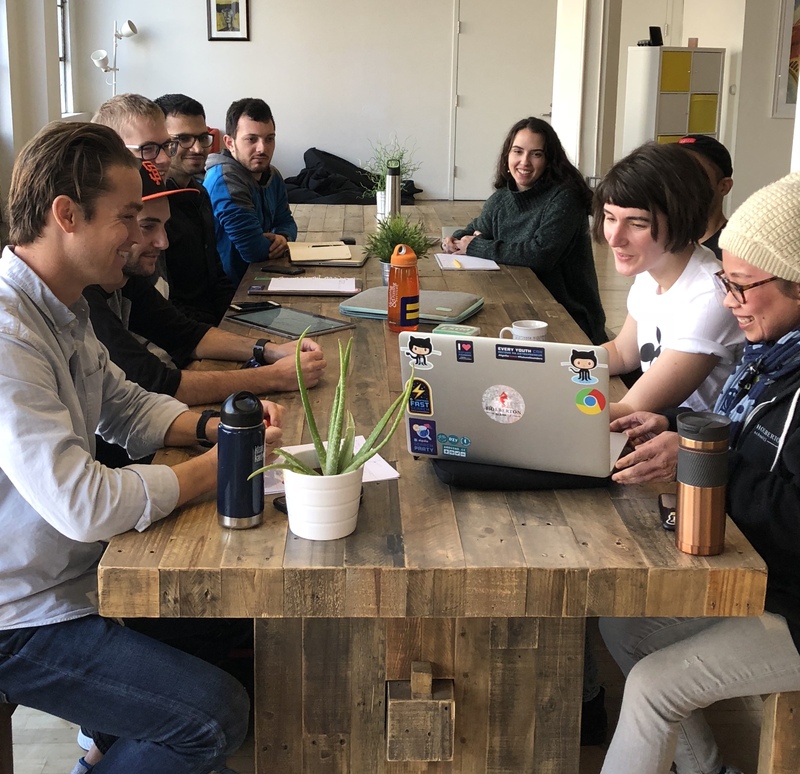 This is an ongoing series of interviews with Holberton students sharing their journey through the program. Holberton students come from many different backgrounds. These interviews are an inside look at each student’s unique journey into software engineering. Rona comes to Holberton School with a bit more insight into the tech industry even though her major in Sociology had nothing to do with coding. However, it had been a hobby of Rona’s younger self, having played around with HTML and CSS. Q: How did you find out about Holberton? Rona: I actually heard of Holberton through word of mouth, from my sister. She knew they were just starting up and she had seen their TechCrunch article. She came back to me and suggested that I apply. There were a few reasons for that, but mainly because I was unemployed and I was still figuring out what my next steps were. When my sister and, in turn, myself, heard that it was free, it was two years long, and that they had this big, almost radical vision about what they wanted to do and how they wanted to rethink education, specifically educating people for tech careers it just seemed cool. It seemed hard to turn down. Q: Tell me a bit about the application process. Rona: It wasn’t that painful. It was a series of challenges to find information. There were two types: going out and finding the information to solve a problem and then sharing information about yourself. I think the biggest part was [building] the website. I remember thinking this is a promising area to go into, because I got really into the project. I took a course for an intro to programming when I was in college and it went alright… I managed to learn whatever they were trying to teach me but I wasn’t sure if that meant I was good at coding or I just took a college class. Q: What are the main differences between the previous course you took and Holberton? Rona: The main difference is that the instructor would walk us through the whole approach from the beginning and you kind of watch and see ‘ohhh, that’s how you do it’ and barely keep up with their problem-solving approach… then later when you get to the problem step, you apply that yourself… which is very different from the Holberton style. It worked but I’d have to say that watching someone solve it for you made me insecure around whether I’d be able to come up with the pieces to solve the problem on my own. Rona: At Holberton, it’s a lot more of an intimate process where it’s you, and the problem, and your peers … I’ve really enjoyed having a lot of freedom in approaching every problem myself. Basically, they say ‘this is what we want to see at the end’ and you have to work on the problem from there. Q: When you were applying what was the mood amongst your family and friends? Rona: We mostly discussed with my mom. We weren’t sure how she would take it since there were no previous students [Batch 0]. 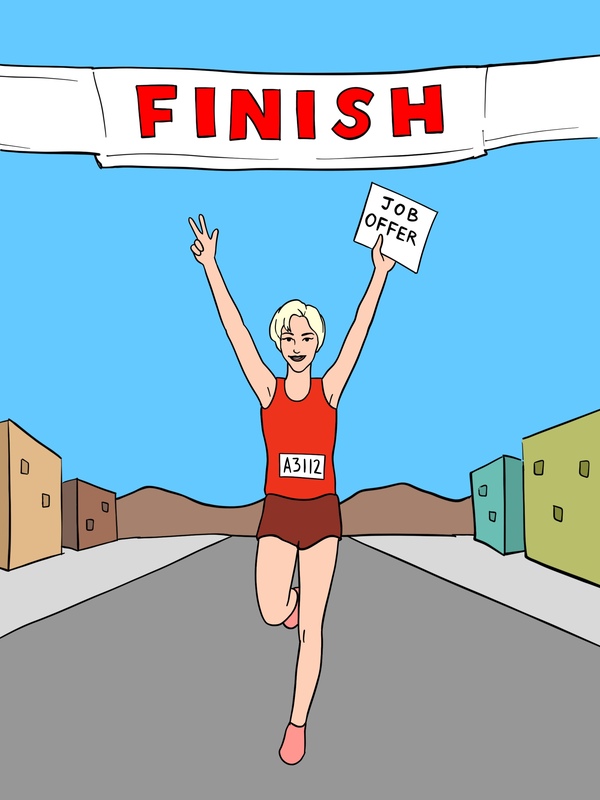 She wondered if I was going to be able to get a job. We had to convince her it was the right decision. Q: How did you convince her? Rona: We just talked about the people who were founding the school, and our brother was in the tech industry so I think we were also relying a bit on knowing that people went into tech that were just self taught and managed to have very good careers. She started off at ‘oh, I don’t know if this is right’ but now she’s happy we did it. Q: What were you doing at Dropbox? Rona: I was there under their apprenticeship for SRE so I was embedded in their databases team. I had one really big project in the beginning. It was cool because I got to walk through all of the steps- thinking through how to code, to deployment, then monitoring, and patching when necessary. Q: Walking into Dropbox did you feel confident with your skillset? Rona: I felt pretty confident. I would almost say I had some hubris because at Holberton we break things down all the time, making me feel like I’m going to do great but, walking into Dropbox I realized the depth of technical knowledge that can be had and how people have an expertise after being in the field for 5-10 years it kind of reset my thinking to realizing there is so much room to grow which is both intimidating and cool. I do think Holberton put me in a good place to tackle the challenges that came, though. Dora: The Novice, Could This Be For Real? A graduate from a typical four year university with a degree in biology, Dora came to the realization that she no longer wanted to pursue a career in her field. Dora chose to cut her losses, and dive into learning how to code. The bet she made on herself has paid off in a big way, landing a full time software engineering position with Scality. Q: What were the different options you had after you graduated? Dora: TJ’s was the first job that sprang up and I just kept it because it was convenient because I didn’t really know what I wanted to do. The idea of going to grad school crossed my mind, or even doing another undergrad but it’s just way too much money that I didn’t have. I was fortunate enough to come out of undergrad without any debt and I didn’t want to take any on. It took something like Holberton to help me narrow down my options. Q: Tell me how you heard about Holberton School. Dora: My friend was having a party and I started talking to this guy that I haven’t seen in years. I asked him what he’s doing now and he said ‘I work at Apple’. I thought he meant in retail… This guy was a philosophy and German double major how did [he] start coding? He told me he learned through online bootcamps. I didn’t even know you could do that! 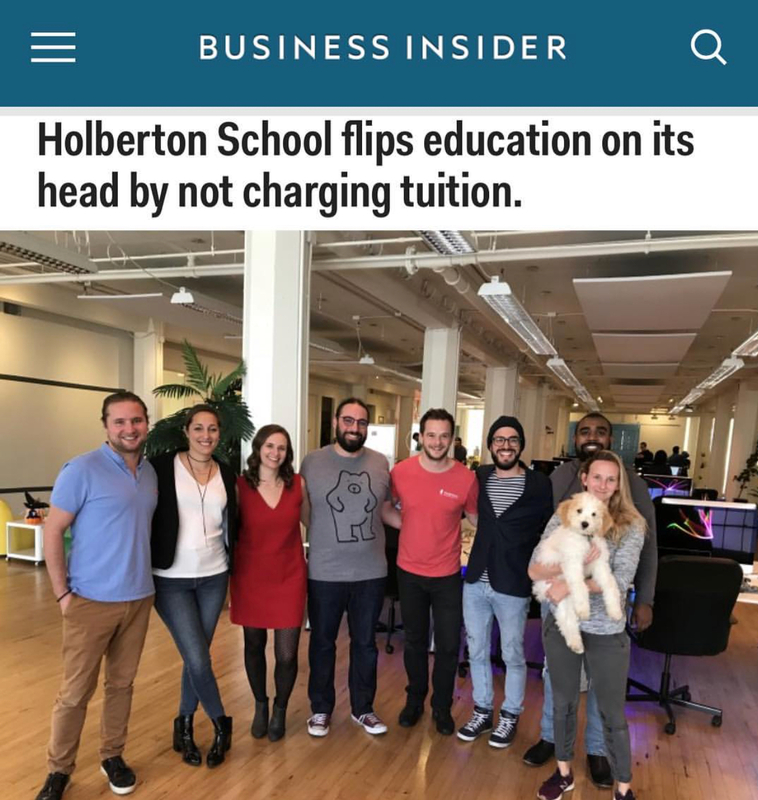 The next day I updated my phone, downloaded the news app and actually saw an article about Holberton School. Q: Tell me about the application process. Dora: I started getting positive feedback from Julien and Sylvain and I was like woah, this is amazing. I got to the third round; the interview process, and it just so happened I was going to be in San Francisco for Thanksgiving, so I did an onsite interview at the school before anything was set up which was really nice to be able to see the space and everything. They asked me all types of questions like ‘why do you want to be a software engineer’. Q: Walk me through the realization of being accepted and actually moving here. Dora: I think it took about two weeks of me actually being here for it to set in that this is actually now my life. It did not sink in at all while I was in Minnesota still preparing. My friends all thought I was doing something crazy, but my family was really supportive. Then, about a week before school was about to start I packed everything in my car and headed out here [San Francisco]. Q: When was your ah-ha moment, when did you know you had made the right decision with Holberton? 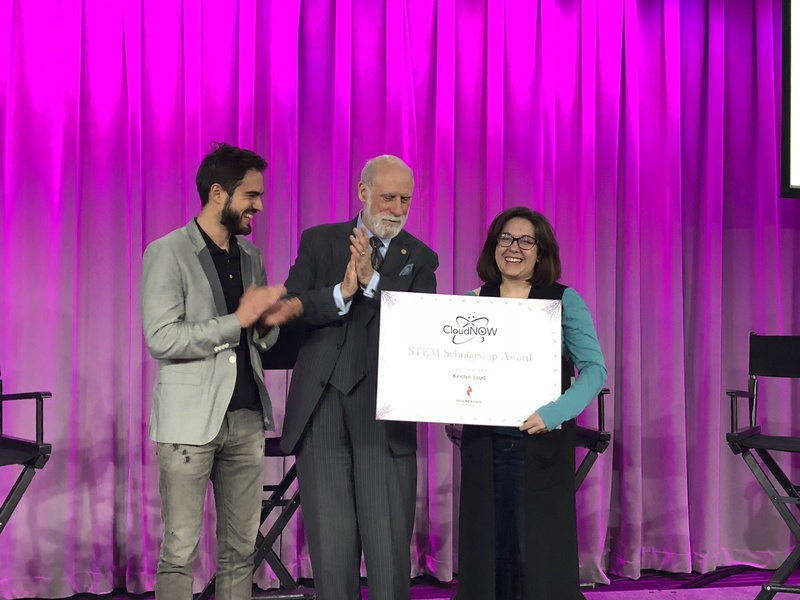 Dora: I remember feeling super accomplished after our hexadecimal table project … since it was more of a logical or algorithmic problem we had to figure out, just gradually building on all of that – I think the pace was good for me. I would struggle just enough but be able to break through and figure it out. Q: Why do you think Holberton is successful in training quality software engineers? Dora: I think the project based learning style is for me… and apparently other people. It’s so much more efficient than sitting through a lecture. The peer learning obviously is huge. Being able to explain something to somebody is one of the best markers that you actually know it and being able to do that on a regular basis is great practice. The mentors are invaluable and it’s great to get to interact with people who are actually in the industry. Holberton is very reflective of the industry itself; all of that is how you’re going to really be working. Q: Tell me about what you’re doing in your role at Scality? Dora: We do large scale data storage and I work on the software engineering team. I work on integrating different clouds to communicate with the API. I’m working to match Zenko (Scality’s open source project) to the backend of the cloud. 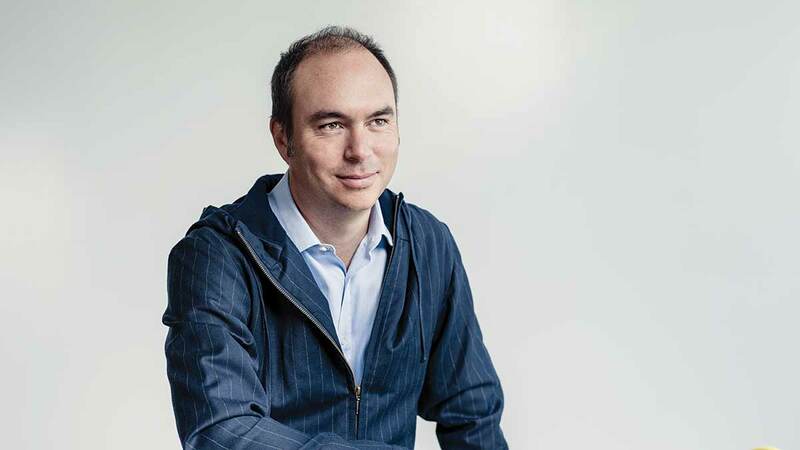 We are excited to be welcoming Stephane Kasriel, Upwork CEO, to the Holberton family as he joins the Board of Trustees. Upwork is the world’s largest freelancing website. Stephane is also the co-chair of the World Economic Forum’s council on the future of education, gender and work. Stephane’s work with the World Economic Forum gives him perspective when evaluating the state of education today. He recognizes that education is both one of the biggest challenges and one of the biggest opportunities of our time. “It can be a huge source of inequality, or done well, a great equalizer- the true American dream.” The old adage of coming up with a solution and not just a problem applies here. Kasriel believes Holberton could be the solution. Holberton’s affordability, and above all, quality are two of the factors that attracted Stephane to get involved. “Holberton trains students for what the industry really needs and teaches them not just the science but the art of development, something that most people otherwise learn on the job or through their own open source community involvement.” This practical approach gives students an understanding at what a day-in-the-life of an actual developer is like. 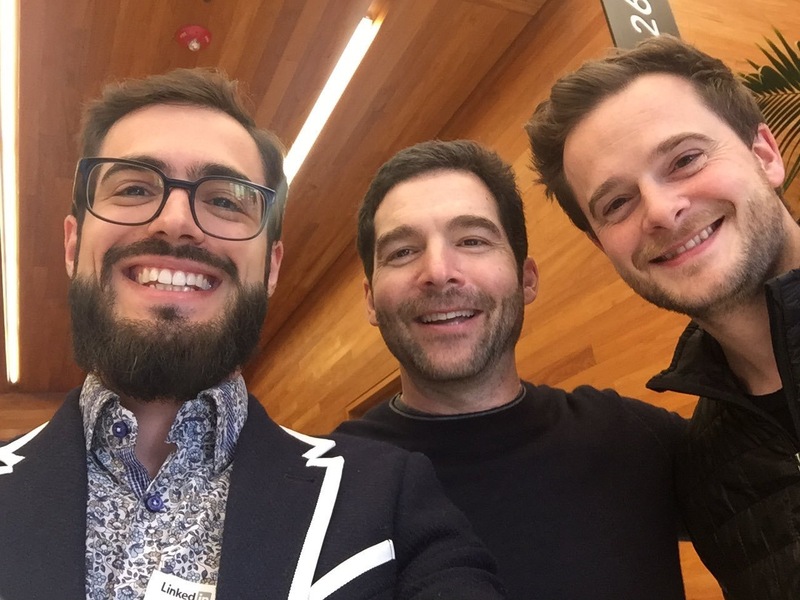 Stephane’s vision for Holberton is to build a truly scalable education system. “In the U.S. alone, we need to train millions of software developers. 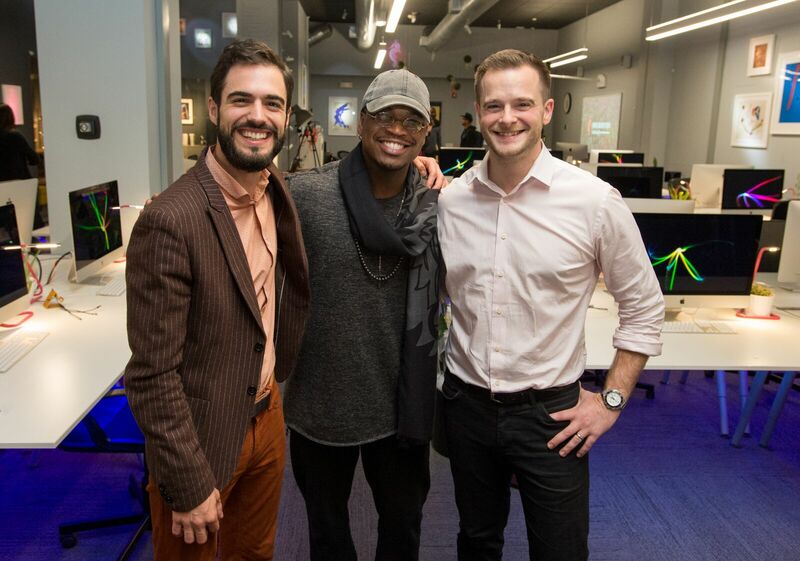 And if you start looking at regions like Africa, where where there will be a billion more adults by 2040, and where they’re missing at least 25 million teachers, you realize that there is a huge opportunity for Holberton to have a giant impact on society.” We’re glad to have Stephane on the team and look forward to continuing the work of bringing quality tech education to the most. 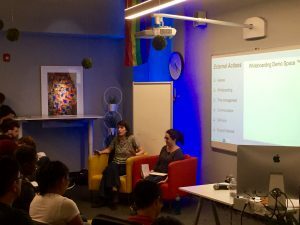 Last night we were joined by Batch 2 rockstars, Naomi Sorrell and Kristen Loyd, who shared their secrets to maintaining success within the Holberton program with their pro tips and advice. In other words: it got real! The pair of students understand that there are many emotions and moods that come along with the fast paced nature of this program, and recognize that the struggle and the hard work make the learning much more gratifying. To highlight a few golden nuggets of wisdom, let’s focus on a few of these. Whiteboarding is something that Kristen and Naomi take seriously! The two regaled us with an anecdote of a four day project they were given of which they spent three of those days solely whiteboarding the code for understanding. This was the main point of the two aspiring engineers. They both agree that whiteboarding helps them fully understand the code they’re going to push out before they jump right to their computers. Check out Kristen walking us through a problem here. Time management is something that so obvious that many forget to budget their time. Naomi suggests using timers to keep yourself on task. She explains the feeling of frustration from working a problem and getting the same error over and over. However, with a timer you can measure your progress. She suggests picking a length of time that feels comfortable for you and once you hit 20, 30, or even 40 minutes the timer will go off and signal to you that you should reach out and ask someone for help. Building and embracing a strong support network seems to be the secret sauce. Both Naomi and Kristen emphasize the strong community aspect at Holberton as an underlying catalyst for their success. Actions as simple as understanding when your partner needs to take a walk around the block, grabbing a quick sweet treat, or even just asking a classmate for help all aid in creating the strong bonds we see between the students.